Garri is a type of flour foodstuffs mixed with water used to be a major part of the diet in the Hausa lands, Yoruba lands, and almost all parts of Nigeria. It also known as cassava flakes is a creamy-white flour and it is a popular West African food made from cassava tubers. Garri is widely consumed in the country and many other African countries owing to its availability and affordability. Garri as a water-soaked food. It can be mixed with cold water for a snack; sugar or salt may be added, and sometimes some evaporated milk. 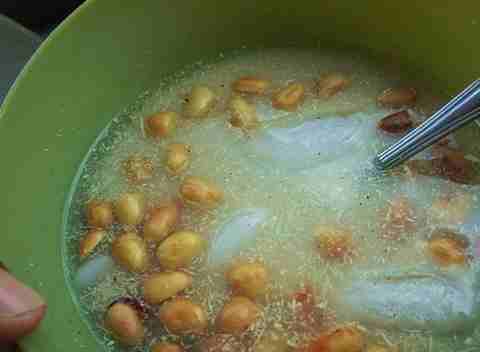 You can also consume Garri by using groundnut usually called Garri soakings. For example, ijebu-Garri is made with finer grains, and has a pleasantly sour taste, making it very suitable to be eaten in this way. In most parts of West African, honey is then added as well as chunks of coconut, tiger nuts milk, and cashew nuts. In most Garri recipes it is cooked by adding boiling water and stirred until a dough is formed. This is served in balls and taken in soups or, with other dishes. Among the Igbo people of Nigeria is known as utara. Garri is used to make a gruel called “fufu” in Nigeria. You can also use it for starch. Garri when prepared on heat and hot water is called Eba a name common among Yoruba speaking people of Nigeria. Apart from being a rich source of energy owing to its carbohydrate content, it is also a good source of fiber which helps promote bowel emptying and prevent stomach cancer. In West Africa, there are two types, white and yellow Garri. Yellow Garri is prepared by frying with the addition of palm oil to give it a yellow color; the white one is fried without palm oil. It is also known that yellow Garri reduces the risk of having eyes problem and other effects. Many variations of yellow and white Garri are common across Nigeria. One variation of white Garri is popularly known as garri-Ijebu. This is produced mainly by the Yoruba people of Ijebu origin. Many people judged gathe food by its taste and grain size. The sweeter types with finer grains are more valued over sourer, large grain varieties. 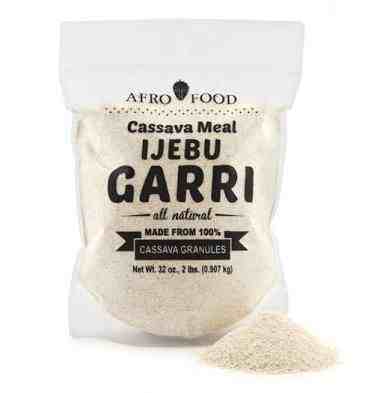 Garri (Cassava Flour) is made from Raw Cassava. Cassava is a tuber crop, which contains a very high level of starch, and is processed in many ways to get an edible end-product. After you have gotten your cassava tuber from the farm or market, Peel off the skin. The next step is to Wash the peeled tubers. Try to wash the peeled tuber thoroughly in clean water and remove all forms of dirty things including sand. Cut the tubers into pieces by pieces. Smaller sizes increase the speed. Then you ground in a grounding machine. After the grinding, the cassava powder will still be watery and need to be packed in long bags and taken to be drilled to promote ultimate dryness in a jack for 2-3 days. When it’s dried, use a wide sieve to sieve off the fine cassava powder from other particles. The next step is to fry using a wide frying pan, fry the powder in reasonable portions until it becomes dry and brittle. Sundry it in a clean environment to reduce the effect of bacteria that may lead to spoilage. The last and final step is to store your garri in a cool and dry place and where it will be ready for consumption. The main health effect of garri consumption is related to the cyanide content of cassava from which it is produced. It is made from cassava which is known to contain hydrocyanic acid. Although the processing process of garri significantly reduces its Cyanide content, it has been linked to eye defects which is the main disadvantage of garri consumption. According to Dr. Ben Ajayi an Ophthalmologist, “Cyanide is slightly similar in structure to Vitamin B12 (cyanocobalamin). So it competes with Vitamin B12 replacing it and adversely affecting rapidly growing tissues or tissues that are regularly being renewed such as the skin, peripheral nerves and the nerve of the eye (optic nerve). It is the involvement of optic nerve which can lead to eye defects and blindness. Garri also leads to intestinal issues and worsening of ulcers. Proper and thorough processing of the food should reduce the concentration of the acid. A study which evaluated the cyanide concentration of six garri samples in Nigeria Published in the World Journal of Nutrition and Health revealed that, four of the samples analyzed contained cyanide in the range of 2.10-9.10 mg HCN/kg which falls well below the permissible limit while the remaining two samples had higher residual cyanide content of 11.78 and 15.30mgHCN/kg which is above the permissible limit of 10.0mgHCN/kg set by the World Health Organization WHO. It is also important to note that, garri that is not properly processed or stored can also constitute a major threat to public health. A study conducted by The Makerere University Medical school and Published in the African Journal of health sciences which analyzed garri from different states revealed that it contains eight bacteria genera namely (Bacillus, Staphylococcus, Streptococcus, Pseudomonas, Clostridium, Salmonella Klebsiella and Coliforms groups) genera and six fungi genera (Aspergillus, Penicillium, Rhizopus, Botrytis, Fusarium, and Cladosporium) In addition to Aflatoxins B1, B2, G1, and G2. Carbohydrates are known to increase weight gain and cassava from which it is produced. A cup of garri contains about 360 calories, out of which 99% is carbohydrate. As such, consuming excess garri is detrimental to your weight loss goals. Garri is highly rich source of energy owing to its carbohydrate content, garri is also a good source of fiber which helps promote bowel emptying and prevent stomach cancer.